Late in an entertaining scrimmage in which Rose was performing spectacularly in his first NBA competition since his meniscus tear last November, George in trying to block a breakaway drive by James Harden from behind caught his foot in the basket stanchion in such an awkward manner even ESPN, which was showing the game, declined to provide replays for the gruesome nature of the injury. The boisterous crowd in the Thomas & Mack Center on the UNLV campus fell eerily silent as doctors rushed to George. George’s parents were there as well. Some players bent over or reeled in shock and despair as Twitter immediately overflowed with messages of support for the Pacers’ star. George was taken to the hospital, where USA officials and players were heading after a brief news conference. 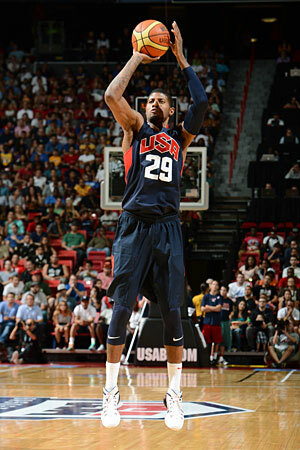 Later in the night, USA Basketball announced George suffered a right leg, open tibia-fibula fracture. None of the players spoke with media after the game as a result. Given it was a college arena, the basket support appeared closer to the court than it does in a typical NBA setting where it is set back farther. The injury, which obviously threatens Paul’s 2014-15 season and thus the Pacers’ fortunes, raised immediately the point of players performing in the offseason for national teams. But Colangelo noted it’s the first such major injury with USA Basketball. And coach Mike Krzyzewski, while declining to talk about specifics, generally noted the possibilities of chance in everyday events. “Anything can happen anywhere,” said Krzyzewski. “A lot of things happen. Tonight it happened during a basketball game. We need to take care of that. It doesn’t mean it will happen again and again and again. It means it happened right now and we need to take care of right now appropriately and move on. It’s obviously most devastating for Paul, one of the top young stars of the NBA, whose career will be put on hold. It’s also a stunning setback for the conference finals contending Pacers, who also lost Lance Stephenson in free agency. And, of course, USA Basketball, which will now hear more calls from NBA teams about their players at risk in exhibition tournaments. The injury left a pall over a buoyant week of workouts that culminated in Friday’s intrasquad scrimmage. The injury occurred seconds into the fourth quarter with the game cancelled with 9:33 left and the White team featuring Harden, Kevin Durant and DeMarcus Cousins leading the Blue team led by Rose, Stephen Curry and George 81-71. Harden led the White team with 15 points with Cousins and Bradley Beal with 11 each. DeMar DeRozan off the bench led the Blue team with 16 points with Mason Plumlee adding 10. Rose had eight points on three of four shooting, one assist and four turnovers in 24:39, tied for the most minutes among blue team players. Until the George injury, Rose was enjoying a brilliant comeback game as the fan favorite and the highlight player of the night. It was obvious from the crowd reaction Rose was easily the most popular player. A rumble of anticipation wavered through the crowd when Rose had the ball. Late in the third quarter with Rose shooting free throws as the Blue team was cutting a big deficit down to 75-69, fans erupted in an “MVP, MVP” chant for Rose. There was clear anticipation based on the crowd reaction almost every time Rose got the ball with some acceleration or an open lane. And Rose did not disappoint with a two-handed slam dunk on a pass from Kenneth Faried that was reminiscent of his powerful dunk over Goran Dragic in 2011. Rose showed no ill effects from his dual surgeries over the last two years as he froze Durant with a crossover drive, missing the jump shot, but also driving in early in the game for a layup as he switched hands. Rose also had a full court burst through the entire White defense for a score. Plus, his assist was on a terrific drive in which the defense followed him, leaving Faried open for a short jump shot. Rose also made a spectacular leaping steal of a full court outlet pass than was more reminiscent of an NFL defensive back. Rose obviously remains one of the most popular players in the game despite not having played for most of the last two seasons. 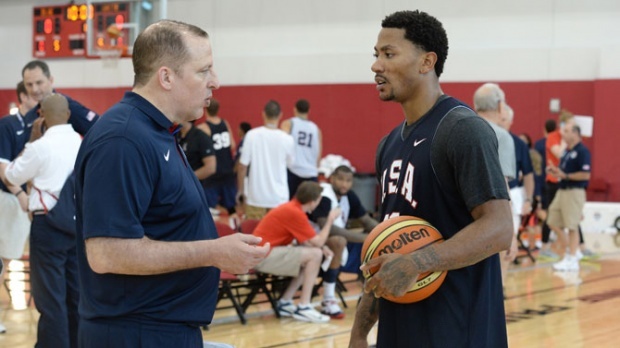 Media had been hearing encomiums about Rose’s play all week from fellow players and USA staff. But Rose’s speed, acceleration and leaping ability looked just as it did before his devastating ACL injury more than two years ago. On Friday, he showed no hesitation in his play. The possibilities danced in the imagination of Rose playing at this level and now with big men like Joakim Noah, Taj Gibson and Pau Gasol and shooting from Mike Dunleavy and Doug McDermott. It had been an overall carnival of highlights with Kyle Korver hitting a pair of threes, Anthony Davis with a block on a Durant shot, save and then outlet pass for a score and Durant then with a powerful baseline drive and reverse slam dunk. 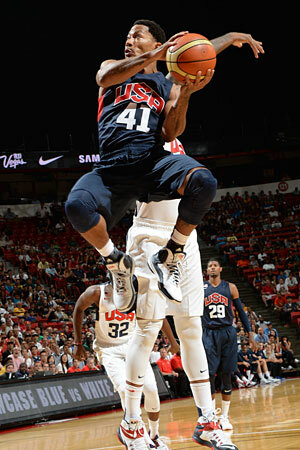 Damian Lillard also two handed in an 85-foot shot bank at the halftime buzzer for a 57-40 White lead. Because of the injury, USA will not make any roster reductions, as planned, for perhaps several weeks as they next gather Aug. 14 in Chicago for two days of training and an exhibition game in the United Center Aug. 16. From this first game, it did show the team probably needs one of the physical big men like Cousins or Andre Drummond since Davis isn’t physical enough to handle all the inside pounding. Mason Plumlee did play well. There also were nice performances from players who weren’t as featured in the workouts earlier in the week, like DeRozan and Gordon Hayward. But after about a 15-minute delay as physicians tended to George, USA ended the game as it was also apparent the players were in no emotional state to continue a game.